Australia is a breathtaking place, home to some of nature most beautiful parks in the world. From hiking to rock-climbing, these 8 national parks have something for every nature lover. But before you hit the trail make sure you’re protected with travel insurance, especially if you intend to participate in extreme sports with your loved ones. Look for coverage that can protect you from high medical bills or worse- denied care. Start with a Google search to find providers within your country of residence. Australians will want to look for Australian travel insurance companies, where Americans will want to find providers in the States. With that safety precaution out the way, here are the top 8 national parks in Australia nature lovers need to see. Ever wanted to see the oldest rainforest in the world? 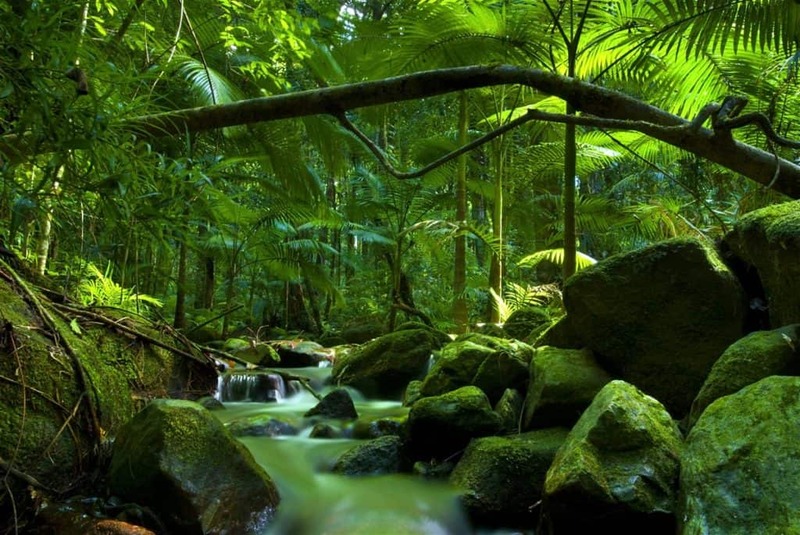 If so, be sure to include the Daintree National Park as part of your itinerary. The park, which is located in Far North, is home to animals and flora that you won’t find anywhere else in the world including the Boyd’s Rainforest Dragon, flying foxes, golden orb weaver spiders, and the Southern cassowary. The park is prone to heavy rainfall so be sure to avoid visiting during monsoon season. On sunny days you may be able to take a dip in one of the freshwater swimming holes. Freycinet National Park is home to red and pink granite mountains that are surrounded by the crisp blue waters of Wineglass Bay. This is considered one of the top beaches in Australia so this park is well worth the visit. If you’re a fan of bird-watching, Freycinet National Park is the park for you. While here you can fish, sea kayak, or just relax on the beach. Kakadu National Park, which is the largest park in the country, is probably the only place on the planet where you can see aboriginal rock art and crocodiles in the same place! Aborigines have made the region home for more than 40,000 years. More than 5,000 pieces of rock art can be found throughout Kakadu National Park. This park is half the size of Switzerland, so be sure to set aside plenty of time to take in the flora and fauna. If you have a day planned to visit New South Wales, be sure to spend a few hours at Kosciuszko National Park. The park is named after Mount Koscuiszko which is the highest peak in Australia’s mainland. The park offers views of pristine glacial lakes that look like they’re straight out of a magazine. In the summer you can hike or go horseback riding while in the winter the park is ideal for skiing. Port Campbell National Park is the perfect combination of amazing rock formations with a little bit of beach. The park is located on the Shipwreck Coast and is home to some of the best rock formations you’ll find in the country. The formations, which are made of limestone, are caused by the Southern Ocean. Not only can you enjoy the natural beauty of the area, chances are you’ll also see a few shipwrecks. The park is also home to all sorts of flora and fauna including wild orchids as well as the hooded plover, skinks, grey kangaroos, and peregrine falcons. 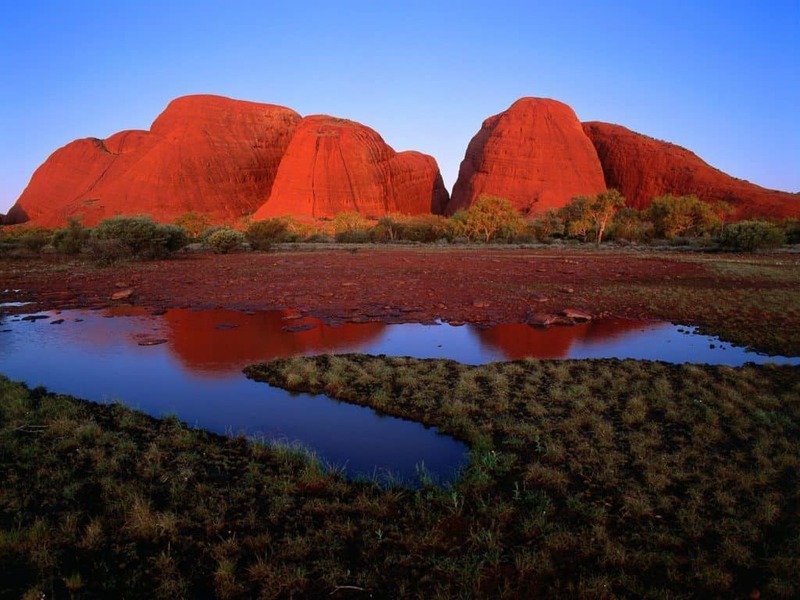 Uluru-Kata Tjuta National Park, also once known as Ayers Rock, is home to the spiritual center of the aboriginal people. The huge sandstone formation, known as Uluru, stands out amongst the Central Australian desert. In the park you’ll find 32 rock domes and picturesque sunrises and sunsets that you won’t find anywhere else in the country. While Purnululu National Park can be seen on foot, the best way to get an amazing view of this park is from above. The Bungle Bungle Range has dozens of beehive shaped sandstone formations that are detailed with amazing black and orange stripes. If you’re unable to see the park from the air, it’s a great place for hiking and camping. Be prepared for some rough yet scenic terrain, and be sure to pack plenty of food to keep you fueled along the journey. At first glance, Nambung National Park looks like something you’d see on another planet. Like other parks, there are cool rock formations that are surrounded by beautiful blue water. The difference at this park is that the formations aren’t in the water! Instead, they can be found in the Pinnacles Desert. Some of the formations date back to more than 3.6 billion years, making Nambung National Park the place to go if you want to experience serious ancient history. The yellow sand of the desert is a huge contrast to the ocean found at Kangaroo Point, making for a true spectacle. The park is home to more than 150 different animals including humpback whales, red and grey kangaroos, dingoes, and more. Wow! Australia got some beautiful National Parks. 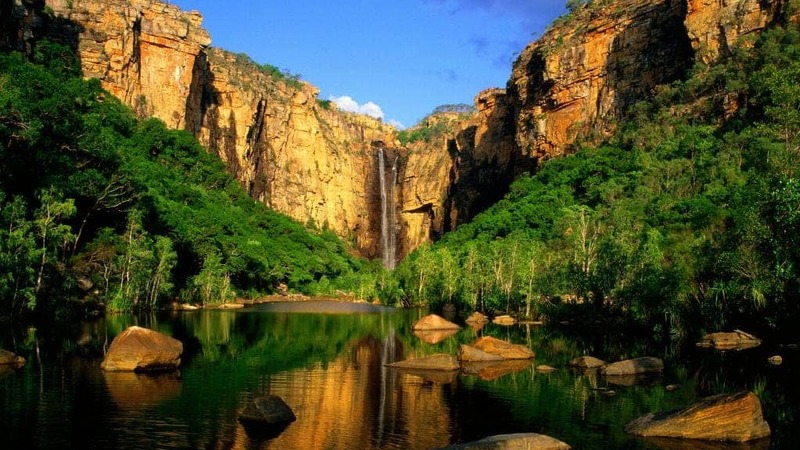 Daintree and Kakadu National Parks looks so stunning!! Such a beautiful australian national parks! You captured great pictures! These parks look really amazing and want to explore. Wow, this is awesome! I had no idea there were so many amazing parks in Australia. Such beautiful photos, thanks for sharing all these places from your road trip. Wow, awesome post! You make me want to go to Australia! I love national park and this is definitely on my list to see when we are in Australia. Thanks again for sharing all these wonderful sites. Looks that they are the best national parks not only in Australia but in World also. I would like to visit all these parks. Thanks for sharing this post. Nice post that makes me want to visit Australia! Such beautiful photos you captured. Thanks for this great post detailing some of Australia’s national parks. This is an awesome post! The pictures are just incredible and I would love to visit all of those parks. Plan to go to Australia in the next year so this is super helpful post! Wow! must say there are some stunning places on the list. Thanks for sharing. Gonna explore at least a few of them. Was looking out for a blog like this one. Amazing clicks! Thanks for sharing. This looks like great place to visit in Australia! the photographs that you have shared are very mesmerizing. This place seems very nice I would like to visit this place. What a fantastic summary, the national parks in Australia seem amazing. There are some outstanding places to explore here. I would like to visit all these parks. Thank you so much for sharing a great detail. This was exactly what I needed! Your pictures make me want to go there and see all the things which you discussed in this post! I love national park and this is definitely on my list. Thanks for sharing it. Good destination you suggested to experience natural things! These national park definitely on my list to see when we are in Australia.. Great pictures and suggestions fun things to see along the way. This trip looks so epic! Such a beautiful part of the world. your pictures seems fantastic in your trip. Really want to visit all the national park which you mentioned in this post. You shared great experience of that beautiful place. Australia is a beautiful country and its National parks are also beautiful. You captured great pictures. These parks look so beautiful I would like to visit here once in a life. what a great country with vast landscapes, greenery, mountains and fields. One of the best thing the world famous beaches around the big cities. These national parks are really amazing and worth seeing. Never thought of these to include them in my travel list, but now i’ll definitely go for them. Wow! Such a great post! This looks like great place to visit in Australia. You captured great pictures in your trip. Want to visit all the national park of Australia. Loved your post! So many places to see in Australia but the national park seems very beautiful. Your pictures make me want to visit Australia again! Such a beautiful photos you shared. Thanks for sharing a great detail. Thanks for this great post detailing some of Australia’s national parks. This is simply an amazing experience to read your blog post. Keep up the good work! Incredible! your photos of the national parks are absolutely stunning! After reading your post i definitely going to see these parks in Australia. Thank you so much for sharing your experiences. This is really amazing and great experience! every picture looks awesome in your post. I love national park and this is definitely on my list to see in Australia.